On Wednesday 13th December King’s College London, in association with the Popularizing Palaeontology Workshop II, hosted a pop-up palaeoart exhibition “The Art of Extinct Animals” featuring some of the UK’s leading palaeontological artists who showcased their artwork and talked about how they go about reconstructing extinct animals and lost environments. The one-off event engaged with questions like: How can artists reconstruct and recreate the life of the past? What challenges, techniques and difficulties are there in this process? How does the history of palaeontological artwork affect current conventions in the field? And what does palaeontological artwork tell us about the relations between science and art? The palaeoartists featured were Bob Nicholls, Mark Witton, Beth Windle and John Conway. Bob creates palaeoart both traditionally (paint and brushes), using software and also as sculpture. Psittacosaurus is a sculpture so the next steps were to create an armature and clay model which was then coated in silicone to preserve detail then in fibreglass to keep it stiff. The sculpture was then cast, after which it needs to be repaired and tidied up before the final stage of painting takes place. When deciding which colours to use it can be difficult or impossible to know but scientific developments are progressing constantly and new techniques enable us to learn more from fossils than ever before. Melanin preserved in fossils indicate likely colours. A good deal can also be surmised by considering the environment inhabited by the creature, evidenced by the other fossils found alongside, trace fossils like coprolites and the geographical location of the creature at the time of death and likely climate. For example, countercolouration is determined by environment – the amount of light, affected by latitude and habitat, determines the degree, acuteness and position on the body of countercolouration. By placing the model in a similar environment to that it is thought to have inhabited you can assess and inform decisions on how to place countercolouration. Other considerations include carotenoids, porphyries, pterines and purines in fossils, which also inform colour, and patterns in nature. Mark observed that it is natural to look at a fossil and wonder “what did it look like?” – palaeoart is about answering that, not by making it up but through scientific research. Palaeoart is more than basic anatomy – lots of new science is constantly revealing more information. So is palaeoart only to inform the lay person/children (non-specialists)? Is it too unknowable/speculative/scientifically meaningless? Is it not relevant to other fields of science? Can palaeoart serve science? Yes. Mark took us through examples of how fossils lead to the artist considering what the remains tell us about the animal and therefore how to depict it. Considering Arsinoitherium (an extinct horned mammal from the Eocene), the horn bone is not dense so what covered it to make it strong? Nature tells us this was likely a keratin sheath. Keratin rarely fossilizes so we cannot see it in the fossil so this makes us ask “what did it look like?” and question how the horns were used. Different horn types exist in modern nature which can be compared to fossils for similarities and the type of headgear extrapolated. Considering Triceratops, it is hard to predict shape of the horn from the bone fossil because it isn’t the complete story so you need to think beyond that and consider how horn grows. For triceratops the horn shape reconstruction tells us the shape changes with age as a result of how horn grows, adding layers within the horn and pushing the earlier layers out and up. Taking another example, Tanystropheus, the fossil might be interpreted as a marine reptile with a long neck or a shore-based angler. Studying the skeleton more closely, tong cervical ribs and a large scapular area for muscular attachment gives power to lift and support the neck. Since this musculature and skeleton would not be necessary in water because water alone would provide sufficient support to the neck we can predict that the creature was a land based fisher. So, the inquiring mind of the palaeoartist informs the artist how to build the creature up from bone to flesh, which habitat to place it in and how it interacts with other creatures in battle, mating and feeding. At the same time this rigorous inquiry and the resultant art feeds back into science, providing new hypotheses and giving context to scientists to then inquire further too. Finally, Mark drew audience attention to a forthcoming publication, “The palaeoartists handbook”. Which is out in 2018 and published by Crowood Press. Beth’s primary artistic focus is the Hyena, a creature known and rercognised by most people in its modern form but which would have looked dramatically different during the Pleistocene due to a far cooler climate. Although genetically the same species as modern Hyenas, those of the Pleistocene would have borne thick, fluffy coats and predated on different animals to today. Beth strives to understand intimately how this creature and its environment would have looked and portray this in her art. Beth spoke with passion about how good palaeoart must be informed by drawing from real life observation rather than relying on past art or Google. As an example, when it snowed recently Beth went out and sketched to capture the English Pleistocene-like environment. She recommended artists visit museums and collections and handle and draw real specimens and visit zoos and wildlife parks and observe and draw from life and real animal movement. Whilst we might not know exactly what a creature looked like, if we can understand its build and it’s habitat, and we really know how to draw animals and landscapes which contain movement and life, we can create good palaeoart. John is an artist who sometimes draws dinosaurs and sometimes doesn’t. John elected to argue that palaeoart has the potential to be a mainstream art movement. John provided a complete – and very entertaining – art history lesson taking us from the beginnings of fine art right up to the modern day, arguing that art has already done everything from realism to abstraction so what is left to be done? Can palaeoart be fine art? Is palaeoart impeded by being representational? Palaeontology provides a new subject for art. Yes, it is technical, but that’s not novel. Art has been technical, fantastical, realistic and everything palaeoart is. So why hasn’t palaeoart become mainstream? Is it because it’s never been pitched as art for its own sake? Palaeoart can inform and entertain. So what is stopping it from transitioning from the stuff of science at one extreme and of childrens’ playgrounds at the other? John didn’t answer the question but left it as food for thought. One thing was certain; the audience at tonight’s event would certainly be glad to see more palaeoart! Following the presentations the audience was able to return to the art displays to appreciate with fresh eyes the palaeoart on display by the four artists, including items available for purchase. All the artists were open to questions about their art and about palaeontology and some very interesting discussions ensued, from the likely function of the hind paddles of a plesiosaur to which creature of highly limited fossil evidence would the artists most like to be able to understand and portray. Thank you to the event hosts and organisers, King’s College London and Popularizing Palaeontology Workshop II, and the artists for putting on such an interesting and informative event. This entry was posted in Reports and tagged dinosaur, event, palaeoart, Photos. This entry was posted in Photos and tagged Finds, fish, fossils, hunt, nautilus, Photos, shark. On Saturday 14th October UKAFH took a group out to the Warren, Folkestone for day one of the Kent weekender. We were blessed with unseasonably warm weather as our group of 30 descended the (pleasantly dry) mud footpath down to the beach to begin our hunt through the Cretaceous period! Once on the beach, UKAFH leader Chris Tait briefed the group on the geology of the location and what we might expect to find. The rocks at Folkestone represent the Albian stage of the lower Cretaceous, 110-105 mya. Lower Greensand is found at the base of the cliff with Lower and Upper Gault clay resting conformably atop, however the clay slumps over the Lower Greensand and is eroded at sea level to release large volumes of fossils onto the beach in this highly productive locality for fossil hunting. During the time these sediments were laid down the UK was at a more southerly latitude in the area of the modern day Mediterranean and a warm sea teeming with life covered the UK. During this time sea levels were transgressing, with the Lower Greensand being deposited as and continued to erode, to be replaced with fine clay sediments once nearby land was completely submerged. The Lower Greensand is less fossiliferous as the near-shore environment it represents was less suitable as a habitat but still contains excellent fossils such as ammonites; the Gault Clay, however, is packed with diverse fossils, some with exceptional preservation. Ammonites, belemnites and molluscs are common; nautilus, crabs, crinoids, fish remains, shark teeth and scaphopods can be found, along with rare finds of reptilia. Examples of all of these were found by members of our hunt group! Phosphatised preservation is typical but quality is variable, with examples often fragmented or in nodules. However many examples are preserved in superb detail in pyrite and those which are newly emerged from the clay can retain some or all of their nacrous shell. Bivalves and molluscs which are newly exposed are often extremely fragile and are rarely collectable unless carefully removed along with the surrounding clay, but ammonites are more durable and make marvellous specimens to add to a collection. Soon after we reached the beach heading towards Copt Point the finds were already plentiful. Partial regular and heteromorph (partially uncoiled) ammonites and bivalves were quite common and finds increased as people “got their eye in”. Some of the group progressed quite quickly along the beach to inspect the slips of clay for freshly washed out fossils and check out the shingle between the large rocks and boulders on the foreshore. Others remained nearer the start of the beach, working methodically through the shingle by hand, with a trowel, or dry sieving, in search of smaller finds like shark teeth. Several members of the group found shark teeth, with Isabelle finding the largest example. At the other end of the scale, Sam found a small but scarce Acrodus shark tooth while sieving using a 3mm mesh. Sieving is a good technique to remove sand and search for small fossils which wash out higher up the beach because they are lighter. Sieving and shingle-searching up the beach yielded crabs, solitary corals, urchin spines, shark teeth and vertebrae as well as fish teeth, a turtle bone and the day’s star find, a swordfish tooth! By the end of the day we had a really great selection of finds amongst the group! The following day we were greeted with yet another gloriously sunny autumn day, enhanced by the towering white cliffs of Dover above our meeting point as Samphire Hoe Country Park. We had another full house of attendees and headed west along the beach to hunt for fossils amongst the chalk boulders on the foreshore. Aidan Philpott, UKAFH Leader, explained the geology and identified local fossils to look for to the group. The lower chalk (also known as the grey chalk) at Samphire Hoe is from the Cenomanian stage of the Upper Cretaceous so yields fossils aged 100.5 – 93.9 Mya. Common finds are brachiopods, bivalves and echinoids. Sponges, shark teeth, worm tubes, gastropods and fish can also be found and, rarely, ammonites. As well as beautifully preserved fossils within the chalk, some echinoids and shells and many sponges form flint casts which can be washed out of the chalk and found in the shingle. Attractive pyrite crystals can also be found in the chalk. Our first find of the lay was an eroded echinoid inside a flint block. UKAFH leader Chris Tait then found a large section of clam. These giant molluscs are mostly found broken into small pieces so this was a really nice find. As the day progressed a good variety of finds were made including echinoids, shark teeth and brachipods. Samphire Hoe isn’t the easiest location for fossil hunting as you need to scrutinise the loose chalk boulders on the foreshore carefully for signs of fossils and then extract them very carefully with a chisel to ensure they are not damaged. You can also hammer the boulders to break the chalk up in search of fossils so work, tools and care are needed to have a good chance of finding fossils here. Once extracted, however, preservation is usually excellent, with fine details clearly visible. Cleaning chalk fossils is easy, requiring little more than dry brushing the remaining chalk matrix with a soft brush (a children’s toothbrush is ideal) to remove any chalk remaining on the fossil surface. As chalk is very soft, you can easily remove larger amounts of remaining chalk with a blunt knife or craft knife until you approach the surface of the fossil and switch to brushing. Finds were pleasing but not abundant, however everyone enjoyed the hunt and the sunshine day. 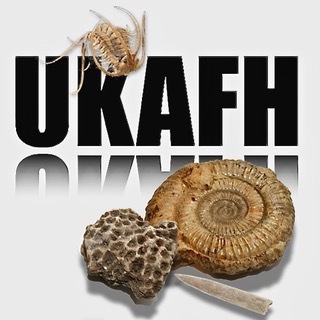 Chris, Aidan and Sam, your UKAFH leaders, would like to thank all of our members and attendees for joining us on our weekend fossil extravaganza and we look forward to seeing you all soon! This entry was posted in Reports and tagged ammonite, ammonites, Chalk, dover, echinoid, event, Finds, fish, folkestone, fossils, gault clay, hunt, Photos, shark.